I love this quote from Emerson. Friendships are made when we connect to other people and have things in common, whether those things are school, interests, or our experiences. Some of my friends are moms, but some aren’t. Some are older but some are younger than me. Some are probably a lot like your friends or your sister’s friends but some might be very different. Each friendship brings out something that enriches my life and to celebrate World Breastfeeding Week, I wanted to share these friendships with the mom friends on momspumphere. 1.The Working Mom friend. You might work together or have children who attend the same daycare, but this is the mom who impresses you with her ability to carry both an infant (in the big carrier) plus hold the tiny toddler’s hand as she balances the daycare lunchpacks on one shoulder with a laptop bag on the other. You think she has it all together because you only have one kid at daycare and you’ve actually had to make two trips from the car because you can never remember every bag on the first try. (And let’s not even talk about the day you drove all the way to daycare without the bottles of milk from your 5am pumping session and had to be late for work because your baby had nothing to drink – surely Working Mom Friend would never let that happen.) Your friendship is born at a backyard barbecue when she reveals that she feels stressed every moment of her mornings and that she has no idea how she will take her business trip to Denver or make the press conference her boss has committed her to the following day. Her doubts are the same as yours and her love for her babies is the same as the love you have for your babies. You will have a wonderful friendship sharing these common concerns. 2.The friend you met at the library or at your child’s school. This mom has a baby who is about the same age as your little one and you might initially compare her parenting style to yours. You ask yourself, “Is her son walking already? Should my son be walking yet?” or “How does this kid know all his dinosaurs at age two – is that even possible?” You see each other but don’t really interact because you’re both busy chasing your babies as they learn to move around and explore their worlds. You chat casually about baby socks or how much you both love the Father’s Day craft the creative librarian put together. Your friendship is born the moment your kids get into a frantic fight over a Thomas the Train toy in the playroom. You find out you both grew up outside the area, and have very few family members living nearby. You both recently quit your full-time jobs so you could focus on family and stay home with your babies. You will watch each other’s children when errands need to be run, when cars break down, and when someone gets sick. Your friendship allows you to laugh at each other’s kids when they say something silly and to encourage them when you see the temper tantrum coming. 3.The friend with kids younger than yours. This friend could be a family member, a neighbor, a co-worker, or a stranger on the street. You look at her with her babies and you remember what it was like when your babies were those ages and you think, “Wow – I remember then” and you smile at her. She doesn’t know you’re smiling because you miss those days but she is comforted by your smile and your friendship is born. She reminds you how fast time goes and that we should be thankful for today’s time with our little ones. 4. The friend who knew you before you had babies. This friend could be from your childhood, from college, or even from a week before your due date – but she knew you before someone called you “Mommy”. She knows about your backpacking through Ireland eating only apples and Nutella, she knows about the awful haircut you got from a fancy salon that someone told you would be awesome (and wasn’t). She knows about your dreams for your life before you had a busy family. She remembers your “5 year plan” when you were 22 and even though life didn’t happen according to that plan, she reminds you to appreciate what’s in front of you and to enjoy everything that’s happening. Do you have friends like this? 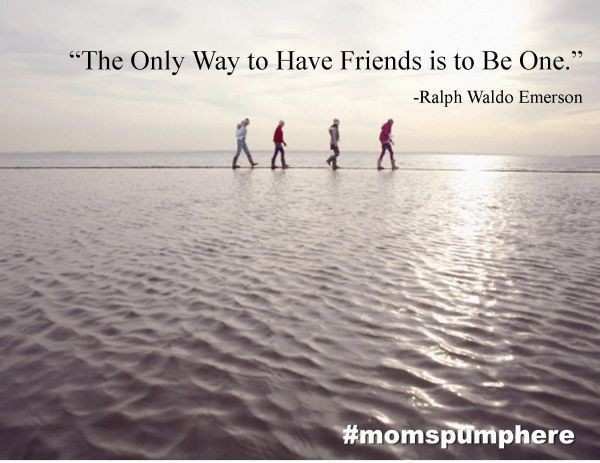 What do you think makes a great friend for you?